Welcome to Day #2 of Chocolate, Sugar and Spice Theme Week. We're celebrating today with a cookie plate. I like cakes and cookies; however, to avoid sugar overload, I save these sweet baked good items for the holidays. Oh, and look at that. It's almost Halloween; so what are we waiting for. The first cookies I tasted were macaroons and pecan chewies from The Phoenix Pastificio (Berkeley, CA)—a company that specializes in organic pasta, sauces and baked goods. And a few of their offerings are gluten free. However, these were not delicate, pastel-colored, filled French macaron rounds. Nor were they cloyingly sweet coconut macaroons. 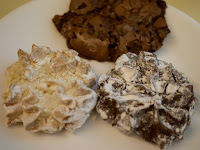 The Phoenix Pastificio's "Best-Ever Macaroons" (regular and chocolate) were decadent and delicious. A "bitter" almond paste center (that maintained a moist, sweet almond brownie-like texture) was surrounded by a firmer, attractive extruded pastry shape. And the whole cookie was dusted with a liberal amount of powdered sugar. 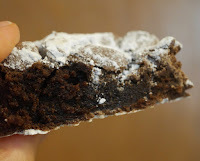 The company's flourless chocolate Pecan Chewy had a meringue-like lightness, and yet maintained a satisfying, chewy chocolate texture with a hint of pecan nut flavor). The Phoenix Pastificio cookies held up commendably well, given that they'd spent some time in my refrigerator since my trip to Oakland where I bought them. 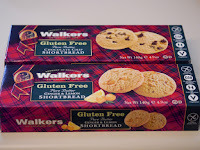 Walkers* (Aberlour-on-Spey, UK/Scotland) has been producing shortbread and biscuits (cookies) for decades. I was delighted when they started offering gluten-free versions of their rich, buttery shortbread rounds, a few years ago. No doubt, the shortbread is the star. However, tiny bursts of chocolate in the Chocolate Chip version gave these rich cookies a little extra flavor oomph. 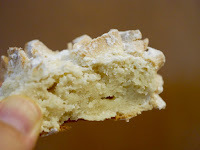 And the Ginger and Lemon Shortbread cookie was also nice. Ginger is always a welcome, warming holiday spice, and a sparkle of lemon added additional flavor. *Founded in 1898 by Joseph Walker, not only is Walkers well-known, but (according to one source I found) they're also Scotland's largest exporter of food items.